The church family at Eltham Park Methodist Church offers a warm welcome to all, whether you are new, just visiting or are a long standing member. Why not join us at a regular Sunday morning service, or perhaps at one of a range of activities that take place throughout the week in our light, airy and comfortable buildings? Our services are for the most part traditional acts of worship with the usual Methodist emphasis on hymn singing, relevant preaching and prayer. 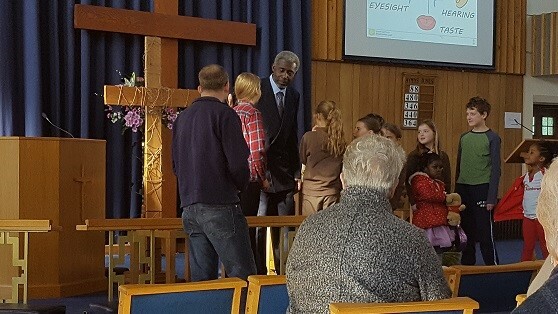 Children are very welcome at all times and enjoy Junior Church, with a crèche available where you can be with your youngest, while still listening to the service. There are regular family and parade services – please see Upcoming Services for details. Our worship is rooted in the core values of Methodism and we offer a warm welcome to all to share the life of our church. We have a traditional Sunday morning service at 10.30 to 11.30 and enjoy a cup of tea or coffee afterwards. Or you might like the less traditional Toddler Church on Wednesdays and the occasional Messy Church after school. We celebrate communion once a month. You will find a wide range of weekly and monthly activities catering for all ages. We are proud of our Edwardian church and our newly-refurbished premises, which are well used by a number of enthusiastic groups. You are sure to find something that you and your family will enjoy.